Business premises on South End. It was previously an Italian restaurant called Obia, which opened some time around the end of 2017/start of 2018. However, in September 2018 a notice appeared on its Facebook page stating that it was closed for refurbishment, and as of February 2019 it remains closed, with the name removed from the frontage and the windows papered over. The premises were previously occupied by a modern British restaurant called Albert's Table photo, but this closed down without warning in Autumn 2017. 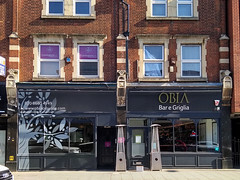 As of early December 2017 it was vacant, but with signs in the windows indicating that a bar and grill called Obia would be opening soon photo. Last edited 2019-02-07 15:21:26 (version 28; diff). List all versions. Page last edited 2019-02-07 15:21:26 (version 28).